For some time I had felt the 3.9 diff was too short for the BMW rally car, giving only 214kmh at 7000rpm in top gear. Given the torque curve and power of the new engine I wanted gearing which would allow me to reach similar speeds but at 6000rpm. I managed to locate a 3.46 LSD unit and then installed it in the car. These mid sized E28/E30/E24 etc differentials are no lightweights - hitting the scales at over 40kg! 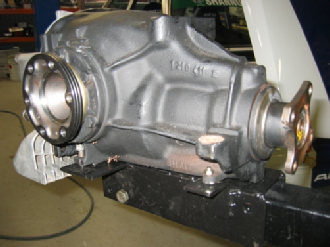 So the challenge was how to remove the old diff and install the new diff without straining my back or crushing my feet. 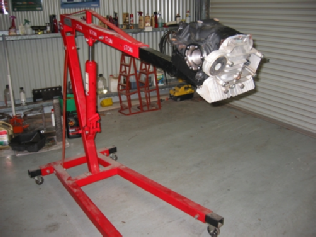 The solution obviously was to buy a transmission hoist but, hold on, they cost several hundred dollars! What did I have which may be adapted for the job - the hydraulic engine hoist. 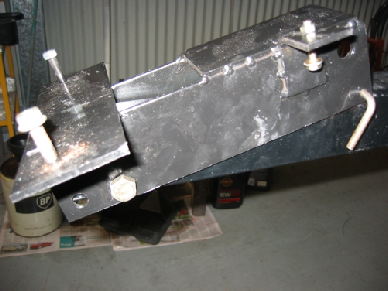 It was not difficult to fabricate a bracket which fitted to the top of the engine hoist and bolted to the diff, therefore allowing easy raising and lowering and eliminating the possibility of the diff falling off. The pics tell the story. I'm sure a similar device could be used with trolley jacks for those who don't have the luxury of a car hoist. The diff bolted to the bracket using two points at rear and one at front. 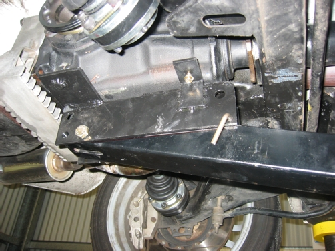 The diff bolted to the bracket - when raised to the car the front is lifted and held in place by a metal rod - see pics above and below. The bracket which supports the diff. 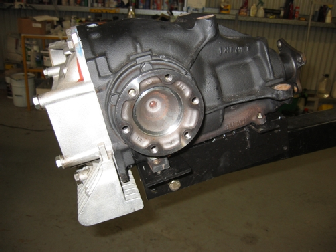 In this case made specifically for the BMW E28/E30/E24 mid sized diff.